The foundation that every single beauty buff wants to get their hands on, this lightweight, medium coverage serum is crafted from colour pigments suspended in The Ordinary’s proprietary ‘spreadability system’. This unique formulation allows the pigments to look natural on the skin, stay on for longer and resist collecting within lines. In 21 versatile hues (with clever undertone identifiers) snap up your shade for seamless coverage – not to mention endless beauty brownie points. It’s caused a serious stir – and when you snap up The Ordinary’s Serum Foundation (if you’re fast enough!) you’ll soon see why. Formulated from a unique combination of colour pigments suspended in the brand’s proprietary ‘spreadability system’, this lusciously lightweight serum glides on for a smooth, subtly perfected, semi-matte finish that lasts all day without settling into fine lines. For an ultra-natural result, it’s available in 21 versatile shades, ranging from very fair to very deep and each classified according to its undertone. ‘P’ shades stand for pink undertones, ‘R’ for red, ‘N’ for neutral and ‘Y’ for yellow, so you can suit your skin tone to a tee. As if you needed further convincing, the formula also offers SPF 15 sun protection without the use of chemical sunscreens. the foundation makes my skin look very glowy and dewy but it arrived with a broken applicator. I am unable to pump out the foundation, instead I must unscrew the lid and apply it from the bottle. not impressed. This is one of my go-to foundation for those days where I don’t feel like I need a lot of coverage. I would say it’s a light-medium, buildable foundation that’s better suited for normal to dry skin. I wouldn’t say it’s the longest lasting foundation but I love how it looks on my skin and it’s really hydrating, so it doesn’t cling to any of my dry patches. The color match is also AMAZING. I use the shade 2.0YG and I’ve yet to find another foundation that fits my skin tone just as well. It’s definitely a natural to dewy foundation so if you like the natural look, this is a great foundation. I tried the coverage foundation in very fair and the serum foundation in NS very fair (I wear Porcelain in LM oil free tinted moisturiser). I am extremely white-skinned, with a few freckles and super thin skin. The very fair coverage was too pink and didn't match my neutral undertones, but the coverage was good and I could use it to conceal spots. The NS serum shade is perfect though, but every time I used it I broke out. Every time. And the effect was not the best, I prefer my LM oil free tinted moisturiser. I have really dry skin and struggle so much to find foundations that don’t cling to it. This foundation is dewy and light and makes my skin feel lovely. I work in an airline cabin crew and by the end of a flight the dry skin shows but a day on the ground and this foundation looks great. This is one of the best foundations I've ever tried! I am always looking for a natural glowy look and this foundation works perfectly. Great price, good coverage but look flawless on skin (I have a normal skin). It's easy to choose the shade, I already bought it two times. I had heard a lot about this foundation and with it being cheap I was a bit cautious.. when I received my foundation the pump was broken so I have to pour it from the bottle! The colour is not right, even though I got the lighter shade it still has an orange tint meaning it’s too dark. The coverage is good but that’s about it.. disappointed. This foundation is absolutely amazing for the price you cannot go wrong and it's a beautiful coverage and it is flawless. I wanted a foundation that still shows my freckles but covers up any redness. This serum foundation is ideal. It doesn't feel heavy on my skin, the shade is just right and it lasts all day. I am definitely converted, and the price is great too. I’d read lots about Deciem products, and this was my first purchase from there, and it doesn’t disappoint at all. I 100% love it, and would recommend it. I have combination skin I guess, some oily patches, some dry, and this sits evenly over both. I wear it over a face oil, and it lasts a 12 hour shift in a busy hospital job with a touch of powder on top, or not. I absolutely love this foundation. It’s my third bottle and I’ve recommended it to so many people. Buildable coverage but looks skin like on the face. I usually wear this foundation when wearing fake tan in the shade 2.0 but have the shade 1.2 for when I’m natural. This is a little too dark but the shade 1.1 is far to light. This foundation is the best I’ve used. Goes on easy, doesn’t clog pores at all - just love it. It is probably the cheapest foundation what I have ever purchased, but one of the best for everyday use for my combo skin. It is controls my dry and oil areas too. I discovered this foundation towards the end of summer (shade 2.1Y) and it was the perfect shade. The formula makes the skin looks even and removes any imperfections without looking cakey on the skin. This is the best light coverage foundation I’ve tried. I've only recently found this brand and so far I'm really enjoying the price, the quality and the products are very good. I've been using 2.0YG on my 43 year old, dry, sallow, blemishes with sunspots and large pores etc, with general dryness and have to say that this feels lovely, smooth and nourishing. The colour is spot on, I was surprised as I am used to all foundations coming out pinkish on me, and I'm definitely yellow not pink. I have one complaint and that's the lack of lid, it doesn't have one, just a pump, which makes keeping in a makeup bag a bit tricky. Overall though, I'm delighted and will buy again. Hope that more products are added to the make up section. This foundation is fantastic and beautiful on. Just love! I use 1.1N during colder months and 1.2N in summer. For some reason they don't mix well together, when I mix them it just rubs off my nose in 5 minutes. But great product and will buy again and again and again. Love this foundation for daily use, makes me look alive! The foundation is very light, I love to use this daily! Bought this for my sister and she loves it as well! And the shade matches mine and my sister really well! Feels so light on the skin and the colour range is great as the shade can be selected based on your undertone. Buildable coverage Bryant never feels or looks cakey on the skin. I was sent a bottle with a leaky dispenser. More than half the bottle has leaked out and the rest has become too viscous, no longer has a serum consistency. But otherwise a great product. A bit dark for my NC43 skin. Bought this with no expectations as I’ve been let down by so many foundations as of late. But this !!! It’s a cross between Nars tintés moisturiser and a serum. Surprisingly okay coverage, low to medium, but I cover my mild acne and scarring with a high coverage like Fenty underneath and then use my hands to apply this all over my face. Don’t be afraid to get a shade darker if you want to look a bit more bronze as it’s so easy to apply and not look streaky etc. One thing, not really buildable, but I use it with ordinary moisturising factors and silicon primer, set with Mac prime and fix coconut spray and damn thé finish is dewy! I’m using this foundation almost every day. It’s very light, and not high in coverage, but the skin colour looks uniform. Very satisfied with the result. Will order again. I loved it. This foundation is perfect to me. It is very natural and doesn't feel like wearing anything on! Just ordered my second. I have combination skin (more oily than dry) and this is one of my favourite foundations. It has a buildable coverage so if I'm having a bad skin day I'll put a layer on with my fingers, wait for it to dry then add a second layer in areas where I need it. I have to set with powder but over the course of the day, it doesn't seem to go shiny but instead turns into a natural, dewy glow. I have a very dry skin so i like it. It covers really good. To me it is better than the coverage foundation. I love this foundation, I have dry/combination skin and feel like heavy foundations cling to my dry patches but this foundation is so lightweight but still holds very well throughout the day. I expected it to be a light coverage that I would have to build up but it's actually got a fairly good coverage and it covers everything I need it to. The price tag is also a big plus!! I bought this in the shade 2.1Y and it matched up well. Anyone reading this wondering what that looks like, I'm shade Y365/123 in MUFE ultra HD foundation. So if that's a shame you're familiar with then 2.1Y might be right for you. I like using this as my daytime/work light foundation. It's very thin and blends in well, giving me decent coverage. The coverage isn't as good as my Estee Lauder Double Wear Light Stay-in-Place foundation, but there's a big difference in price. For the price you're paying, I think this does a good job. Of course, it's build-able if one application isn't enough. The only reason I don't give this 5 stars is that the pump bottle dispenser applies too much pressure, so the thin liquid often squirts out with too much pressure. This has left foundation splattered on my clothes, mirror and furniture. Definitely, one to pump out near the bathroom sink. Absolutely love this. I have exceptionally pale slightly pink toned skin and I REALLY struggle to find foundations to match my skin. 1.0 p is perfect for me. I have very oily skin and always use this after the ordinary's primer. The coverage is excellent (a little goes a long way) and it stays where it's put for at least 12 hrs. I've seen other reviews that say it sits in fine lines but at 40 I have plenty of fine lines and I don't find I have that problem. Maybe it's because I always use their excellent primer first or maybe it's because I always use as little as possible. I don't like to look like I'm wearing makeup. I was looking for a cheap alternative for everyday use to the Bobbi Brown serum foundation, and I'm very happy with this one and it's price tag! I'm a MAC NC45 usually so I tried the 3.1Y and it was a little darker than expected but ok as I've got a tan at the moment, but I've ordered the 3.0Y to try and/or mix. I have very dry skin and this leaves it looking nourished and dewy. Blends easily with a very runny consistency, so I just pump onto a palette to mix or straight onto my beauty blender. I've had compliments from friends since wearing this saying it's looks flawless on my skin, so I'm happy! Maybe I was hoping for too much, but nevertheless I was disappointed. Too watery for me, even though I prefer light coverage and thin foundations. My main issue is that it made my pores extremely visible, which has never been a problem with any foundation before. So, it simply made my skin look worse... I agree with one of the other reviews: it's not a foundation, it's water with some colour in it. This is not a foundation, just water with colour. Impossible to blend. I really wanted to like this foundation but it's really not for me. I'm late 30's with normal skin with some hyperpigmentation and 2 children, which means fine lines and regularly, dark circles under my eyes. This foundation actually makes my skin look worse. It settles into any fine lines, highlights areas of dryness I never knew existed, highlights any bumps and imperfections, and it feels weirdly oily on my skin. Straight in the bin! I bought 1.1N and 1.0N and I'm between a NC10 and NC15 in MAC. 1.1N is slightly too yellow for me - although not really noticeable when set and properly blended. However, be aware that "neutral" isn't really a true neutral - there are definitely noticeable yellow tones in there. As for wear, it's pretty good. Given the price, I expected it to be pretty average, so was pleasantly surprised. Be prepared to touch up during the day if you're wearing it for 8 hours though. It's very watery but applied fine and wasn't sliding all over the place, and I've worn it over the MAC prep + prime skin primer as well as BECCA backlight primer with no issues. 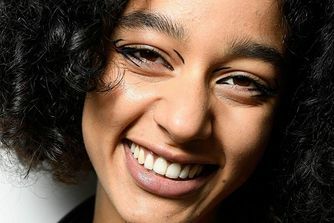 It does settle into some fine lines (think forehead lines and the bits between your top lip and nose), but you can just go over them with a buff brush to even it out again. Some people mention breakouts but I haven't had any, and my skin is definitely temperamental sometimes. Didn't oxidise badly for me, although some people say that it did for them. Really easy to remove too and doesn't cling to your skin. It's worth the money if you're looking for a cheap foundation for off-duty days, or if you don't want heavy, full coverage. I like it for that reason! It does feel like your skin can breathe and it feels a lot more natural than the "mask" feel you can sometimes get with full coverage foundation. But if you want a foundation that will stay in place all day, this won't fit the bill. Given the price, it's worth a try, and it's not a huge loss if it's not right for you. I have the coverage foundation too and I love this one just as much! I’ve started using this one on a daily basis for a more natural look, even though it says it’s light coverage I would say it’s medium and very buildable. So lightweight and doesn’t separate or cling to dry patches. I LOVE this so, so much! The coverage is so natural and light, I can't feel it on my face and it goes very well with natural freckles like mine. It doesn't leave a strange finish like other foundations would on my freckles and my skin feels and looks really soft with this on. Would buy again, amazing price as well. Arrived yesterday and I couldn’t wait to try this on, I bought this for daily use cause it’s cult product at the same time the price is very low compared to the quality. I use Mac, make up forever , Estée Lauder foundation and I was looking for a cheap alternative, and omg after trying this on, I couldn’t believe, it was so so good. Highly recommended. Okay, okay, I admit I have incredibly dry skin. And I can't hold that against a product! Since my last review, I've switched to using just one pump of this in with my morning moisturiser and underneath my powder. It mixes so well, somehow offers more coverage, and I'm loving the result. Out of interest, I tried the same with my previous foundation and somehow came out looking bright orange. I'm very happy with this product, now. Don't think I've ever used foundation this habitually! I used many foundations both cheap and expensive and I could never get a natural and healthy look on my face. I wasn’t expecting anything great from this foundation but I was very surprised. The coverage is good but the foundation itself is not heavy so your skin breaths and looks very natural. I would definitely buy it again!! The first time I applied this foundation I tried it with my fingers and it looked awful, sat in every crease. I gave it the benefit of the doubt and tried again with a brush, primer and set with powder, it looked stunning, my skin looked completely flawless and product layered perfectly on top. During the course of the day it started to separate all over my face (this may not be completely the foundations fault but the mixture of products) by the end of the day after taking my makeup off my forehead had broken out (I rarely get spots and never on my forehead) so I think for short term wear its beautiful but I wouldn't leave it on my skin for any length of time again! Can't believe how good this foundation is for the price. It's my new favourite; stays on all day lovely colours too. I bought this on the recommendation of a beauty blogger who blogs about rosacea, which I struggle with. She said the coverage was astonishing, and the fluid was light and not irritating - perfect for those of us with hyper-sensitive skin, so I gave it a try. It blew me away. The coverage is smooth and complete, but the fluid is so light it doesn't settle into lines or creases. It doesn't irritate my skin at all - which is basically a miracle. And I found a skin match at the first go. I'm now buying more. I'm a real fan. I have tried countless foundations from all price brackets - and this one suits my skin and my budget! I have oily/combination skin and other foundations would always slide off during the day or break me out. This one is light and breathable but with a buildable coverage. Someone with normal/dry skin could probably use it alone but I always set mine with a light bit of powder on top. Wanted something lighter than my usual foundation so thought I would give this a try, completely blown away by it! It's so light and silky on my skin but yet has really good coverage (better than my previous foundation which i paid £30 for) it looks really natural and non cakey, especially if used on top of the fluid primer. For the price it's so worth trying! This foundation is not for you when you have oily skin. I usually use primer and foundation but when I use this foundation I have to set my face with powder because it looks so shiny. But not the nice shiny look, more like....bacon. And it gets worse through the day. I was very disappointed and rather use my Huda Beauty or Urban Decay foundations. But as a plus for this foundation: great coverage. This one topped my all time fave MAC face and body foundation which was my go to for a natural, sheer-medium dewy finish. It really does have a very subtle but buildable coverage, yet it really gets the job done. If a foundation can still make my skin look like my own skin but just more flawless (without heavy coverage, cakey and opaque look) I'm all in and this does exactly that. Has that skinlike dewiness to it but not to the point of looking greasy. Really recommend this to anyone who is more on the drier side (bearing in mind you use peeling, otherwise no foundation will look great). I was caught up in the hype and got so excited about this product. But it just looks terrible on the skin. I have regular to dry skin and it just looked so unnatural and uneven. I gave to my friend who has combination skin to try and she got the same results. This foundation gives me a gorgeous colour and dewy glow. It's really buildable and given the price point has become my everyday go to. 2.0n is perfect for me and I've always found it hard in the past to find shades that are not too pink. Buying 2 or 3 more. I've only been using this for a few days, and all of the women in my team have commented on how good my skin looks. I've wanted to get my hands on this for a while and am so happy I did. both this, and the full coverage, work perfectly for my combination skin. I find the coverage is perfect for what I need day-to-day. I would definitely recommend if like me, your skin is usually well behaved and you're looking for a soft, dewy finish. Considering the price, this is the most amazing foundation I have ever tried. I have dry skin and this feels so light and moisturising on my face. I have tried most drugstore and high end foundations and this is almost as good as Lancôme but with less coverage. It's light but build-able and would be good as an everyday foundation. Also Cult Beauty always offers the best service, arrived promptly. I love the Ordinary products and had high expectations for this foundation, but it turned out to be a total disaster. It's hard to spread and looks like a mask. What can I say is there're lots of better foundations for that price. Firstly, I would like to say this is a very light coverage foundation which is what i need for my skin (if you are looking for a high coverage stay away). For those saying its like water, it clearly states you need to shake before use, once shook its the perfect light weight consistency. Leaves a satin finish with a slight glow however still looks amazing once powdered for a matte finish. Mine is in the shade 1.1p (fair with pink undertones) and suit me perfectly. Overall highly recommend for low coverage gals like myself. For the price this foundation is absolutely amazing. It covers all spots and imperfections, it can be a little cakey but it's fine blended well with a sponge. This foundation is perfect for people with normal/dry skin. The finish isn’t too matte or too dewy, very satin finish, and blends in nicely with concealers, cream contours etc. It doesn’t cling to dry patches and is very lightweight on your face, and medium coverage. If you are wanting 2.1 y, I definitely suggest go for 2.0 yg as 2.1 y oxidises terribly and ends up drying bright orange. 2.0 yg dries slightly darker but not orange toned, more of a gold tone and looks a lot prettier on the skin imo. This foundation is definitely worth a try, even if you are a bit iffy about it. I’ve read it’s not good for acne prone skin, but my skin is extremely dry and looks really nice and smooth on my skin. It’s a good dupe for the nars sheer glow foundation which used to be my everyday go-to, and an eighth of the price! Absolutely recommend trying it out. Stay away from this foundation if you have sensitive skin. My face broke out like crazy after using this foundation. I’ve bought in 3 shades and absolutely love it. It blends well, neutralises my pink undertone and lasts all day. Lovely glow too. Highly recommend and fantastic price. I had very high hopes for this foundation so I ordered 2 shades when my right shade was out of stock. I don't ever write negative reviews but I absolutely hate this foundation. I tried to make it work but everything I put on top of it looks like crap. I'm throwing it away. I have combination skin - oily yet with some dry patches. Yet this foundation cooked perfectly with both aspects of my skin. Incredibly lightweight and moisturising on my dry patches but didn’t make my skin oilier and still gave a reasonably good coverage. The perfect base, this foundation is everything it’s cracked up to be. I would highly recommend to those wanting a lighter coverage, something natural or more dewy, or with combination skin. Made my skin flare up and caused redness and irritation on my cheeks. It´s sheer and lightweight, at first I loved the finish, but then I tried it for a long workday and it isn't perfect for oily skin. It started to be very dewy after 2-3 hours and broke up on my forehead. I tried this with more primers and fixing sprays. I think this could be good for dry skin. The ordinary products are slowing filling my bedroom and this one is definitely one to stay! A lovely light coverage foundation that I use in the daytime, and the shade choices are great for my pale complexion, I use 1.1P the pink undertones make my skin look dewy and healthy! This foundation is reasonable but it does not dry in at all and smudges off at the slightest provocation. Only good if you are only wearing it for a couple of hours. I have dry skin and this foundation works for me only with some kind of moisturizer underneath. its light coverage. its my second purchase and i cant find my color match. i think its neutral it is still yellow. but it lasts all day and with the moisturizer the finish is really natural and dewy. I discovered this amazing and inexpensive serum a few months ago. A little goes a long way and the price is fantastic. I have very fair Celtic skin and this suits me perfectly..I also have freckles and ageing skin which keeps it moisturises ed all day long. I leave 2 stars because it's a tad better than the coverage one which is really bad. This one actually has a bit more coverage and it's not that oily, even though it has 3 ingredients which are bad for oily skin and the coverage has only 2. Both have:Coconut Alkanes, Polyglyceryl-3 Diisostearate and the Serum one also has Stearic Acid (also the Natural moisturizing factors has this one). One of the best foundations I've ever tried. I like a lot of the Ordinary products, so after seeing some online reviews of the Serum foundations I've decided to try it. I love it, the coverage is good, not too heavy not too sheer, it leaves your skin glowy and with a natural and lightweight finish. Perfect for everyday use (also for the price) since it last very good. The shade 1.2 N matches me perfectly. What can I say about The Ordinary Serum Foundation? Words fail me. Truly awful. I purchased shade 2.1Y. If one wore it you certainly would look as though you'd been Tangoed......for those who remember the ad. This stuff is cheap for a reason......walk on by. I’ve tried lots of different foundations and Ordinary serum is one of the best so far! It goes easily and seamlessly on the skin, stays on all day. It doesn’t go patchy or separate weirdly during the day! New fave. I switched to the Ordinary after using much more expensive foundations after reading all the raves from beauty experts. I have rosacea and hyper sensitive skin, so I need something gentle and with good coverage but not heavy. The serum foundation is perfect. When you first pump some onto your hand it's liquid, not at all thick, and you might think you won't get coverage, but it's heavily pigmented. So that light liquid covers the red spots that rosacea sometimes gives me, without overloading my no longer young skin. The t 2.0 perfectly matches my hard-to-match skin colour. It's so odd how well it works. It doesn't look like I'm wearing makeup at all. It just looks like I have perfect skin. I use mineral sunscreen as a base and the combination lasts all day. I use blotting powder to soak up excess oil, with a dusting of rice powder to eliminate shine and that's me done all day. Highly highly recommend. The Ordinary is quite simple.. Brilliant. I am not a big make-up wearer. This is the first coverage product I have used in years and I was not disappointed. It feels like it sinks in to my skin, leaving it even and glowing. 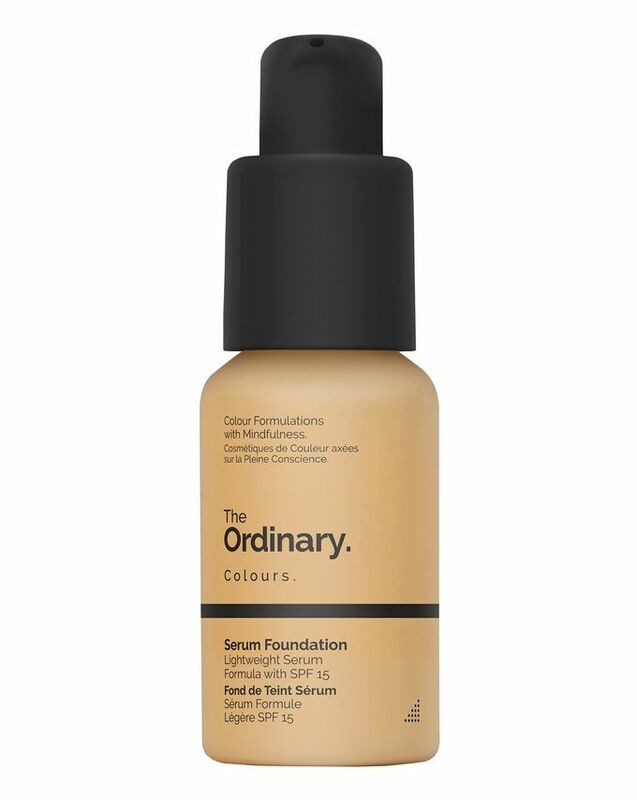 If you are looking for a natural, dewy looking complexion... then the ordinary serum foundation is the perfect pick. Love! This is a lovely, lightweight every day foundation that works perfectly on combo/oily skin. I like the fact that it feels light and matches my complexion perfectly. It doesn't feel like I have any makeup on and it doesn't clog my pores. It is also the cheapest foundation I have ever purchased and gives a lot of drugstore foundations a run for their money. So so bad. Totally oily on my skin, powder didn't sit well on top. Would not recommend. I can’t believe how cheap this foundation is. I can honestly say it’s as good as any high end foundation. I wanted something to replace my Nars Sheer Glow Foundation as they are no longer cruelty free. I think this is far better. It doesn’t sink into my pores and blends very easily. It provides a light coverage which gives you a dewy complexion, but you can apply more for a medium coverage. Lots of different shades to choose from. AMAZING!!. Really great for my normal to dry combo skin and gives a beautiful finish that events out the complexion. It doesn't look too cakey when powder is applied afterwards. Has a very lightweight feeling that blends very well into the skin and is brilliant for everyday wear. I suffer from oily skin and my pores are huge so I also get spots from makeup and since I’ve worn this foundation my skin hasn’t been clearer! I work in a hot and busy restaurant and this foundation absolutely does not budge! Its so lightweight and the coverage is amazing, its definitely my new “go to” foundation, I absolutely love it. I cant stop using it! Love it on its own and for mixing with full coverage foundations. Affordable and great. I found the perfect application when I add one pump to my moisturizing cream. The results are excellent. I’ve been using this foundation for nearly a year now and it is the best (and most affordable!) one I’ve tried in a long time. It’s light but with good coverage, doesn’t cake and looks very natural and glowy. There is also a huge range of shades which is great. Previously I was using the Nars sheer glow, which is 5x the price. I like this one just as much. After a lifetime (I'm 68) of trying SO many foundations, it is an absolute pleasure to find this one. It sits beautifully all day - I have dry skin - but this gives me a dewy finish & doesn't start to "crack" over lines & dry patches. Love it. Will buy again. It's been a few years since I used foundation because I can't stand the feel of it. When I had to use it yes or yes, I always tried a powder foundation since it feels less like a mask. CC, BB and moisturizers with colour either didn't do much or I still felt them on my skin. This one is wonderful, it doesn't seem like I'm wearing foundation at all while making my skin tone uniform and diminishing dark spots. This serum foundation is what every bb and cc cream should have been. It's true that it can settle on pores (and fine lines but I don't have experience with them) but to avoid it you just need to let the foundation settle and be absorbed for 5 minutes before putting anything over it. Also, the lasting power is good and the 1.2N colour is the perfect match for my fair neutral-cool olive skin. it's a nightmare finding a good shade for olive skin but for some reason, the 1.2N shade is spot on, I still can't believe it. Lovely everyday foundation. I'm over 50 with a few fine lines and this is great. Wasn't sure at first as it's so runny but easy to apply using a sponge. Skin looks and feels so much better and stays on even through "hot flushes"! I buy 2 shades and mix for a perfect match. At this price, why not! I’ve got mixed feelings about this one. I HATE the way it feels on my skin. It moves around, it transfers and it feels sticky the entire day. Yet I love the way it looks. Medium coverage, dewy finish and even though it moves it still looks beautiful by the end of the day. I tried the coverage foundation which was too dry. I prefer the way this looks, it’s just the way it feels. I've already ordered this 5 times. It was easy to find a shade for my pale skin. I would compare the consistency to the NYX foundation drops. The bottle is great for travelling as it is so lightweight. This serum foundation is amazing, I work long hours filming and it stays on all day without any top ups, I have tried so many foundations in the past and this is by far the best, this is slightly better than Fenty but only slightly, this product is well worth the money. It is a bit of light wear for my liking, but not bad an also long lasting, hence my very oily skin. I usually mix it with other foundations to make them lighter, and it works great! Really good. I love the large variety of shades. Great value for money. I wore this on holiday in warm weather and it stayed on perfectly. Gives a really natural look but hides imperfections. Almost as good as my normal €40 foundation.Will definitely buy again! This is the best foundation I have found for oily skin. It is so inexpensive and the highest quality. This entire line of products is awesome. I'm 64 with very, very oily skin and this entire product line has been a godsend. I have really dry skin and feel the foundation doesn’t cling to my dry skin. Really happy with this foundation and it’s very cheap. I am over 50 and bought this foundation and have had no end of compliments. Although it gives light coverage which is what I wanted, it gives the skin the most wonderful glow and seems to actually do the job of a serum at the same time. I really like the fact that it identifies undertones as well as depth of colour. You can really skin match well with this product. The formulation of this really is a shame. The colour and finish are beautiful but at only 23 years old it still settles into any teeny tiny line on your face and will generally make imperfections look much worse, regardless of primers. For me its okay if I'm going out a need something light for a short about of time but the staying power is terrible and on an oily skin this would be a disaster. For the price, definitely give it a go and I'm still glad I have this in my collection but not the wonder product some make it out to be. I hated this foundation in winter when my skin was dehydrated and dry but now it's summer and I love it! I still feel like it would suit combination/oily skin better cause it's semi-matte. Personally, I use this one when my silicone primer is not fully absorbed and spread real quick either with an oval brush or with my fingers. Paddle brush can also work but damp beauty blender dissolves it. It's a water based foundation after all. Ultimately best foundation I have ever ever ever tried. I usually use the Kevin Aucoin Sensual skin enhancer or Nars foundations that cost a fortune, and this is just so much better than those! Makes my skin look oh so natural and glowy! It really enhances your natural skin and just quietly covers any small imperfections! I have freckles on my nose, which I like that you can see, and this foundation really works nicely with my freckles, not erasing them! 10/10 would recommend and buy again and again! Texture smooth and colour match my skin colour but after 2-3hrs oxidized 1-2 shade drop, control oil a little for 3-4hrs but if you set by powder they can control 4-5 hrs. Easily remove by water cleansing. Good job. Lovely light-medium coverage with a really nice skin-like finish. Will be purchasing again and would really recommend for everyday usage! I bought 1.1N and wear Fenty beauty 120 for shade comparison. Got the 2.1 Y Medium, matches my south-east Asian olive-y skin tone really well. My skin looks less dull as it adds a slightly yellow tint to it, giving a nice golden overall tone without having to use a bronzer. I have combination skin and use this after toner, serum and/or dry oil (winter months). You have to shake it pretty well to ensure coverage but it glides on smoothly and doesn't feel dry after it sets. Just a pump is enough for a light-medium coverage. Will definitely purchase again. I had low expectations of such a well-priced product. How wrong I was!! I bought two colours. 2.0 and 1.2. I originally just had the 2.0 but it was a touch too dark, 1.2 was too light. Mixed together...perfect. I suffer from really bad facial redness due to spider veins. I have tried pretty much everything to disguise and this foundation is the only thing that covers, stays put and looks natural. I have also tried the Ordinary Coverage foundation, but the serum sits better on my skin and lasts so much longer. Especially when teamed with the High spreadability serum primer. I feel beautiful when I'm wearing this. Extraordinary stuff from the Ordinary. Love you guys. Keep up the good work. Bought the 2.0 YG and it’s perfect for my medium-fair-yellow skin tone. It gives the perfect not caky covering and I really like the light powdery finish. Bought this as an alternative to mac face & body as I was looking for something equally light coverage and buildable. I have combi skin occasionally on the dryer side n found this sank straight into my pores and made my skin look dull and flaky even when combined with their argan oil. I'm not very fussy with makeup, I don't use a lot of it and rarely have anything bad to say but I'd heard so much about this one so it was a real let down. Also, serum to me makes it sound like it'd have a dewy finish but on me it gets powdery. Maybe it just doesn't suit my skin but as someone with a pretty standard skin type, it's disappointing. Recommended by YouTube makeup artist and I was excited to try it. I'm 43 years old, I have combination skin. I've tried it with and without primer of varying brands and it's terrible. The worst I've ever used. It just slides around all over my face and will not stick at all! It makes my pores look so much worse and I look like a grease ball. Around my nose is awful and just creases immediately. It is light coverage which I don't mind and the price was right up my street. Such a shame after all the hype. I don't know whether it was the branding or what, but I fell for this one and I'm really annoyed I did. It feels lovely when it's going on but it very quickly gets very dry and I'm not sure at all about the coverage and colour options. I'm going to try mixing it in with my moisturiser from now on to see if that improves results. Probably a good option for people with skin on the oilier side, who only want sheer / buildable coverage. Good coverage foundation, also very moisturizing and lightweight. The shade 2.0P suit my skin perfectly. I really wanted to love this. But it seems to just cling to my dry skin and is incredibly watery. Obviously it does say it is light coverage but it is buildable. I don't hate it...I dont love it...but its definitely worth the price tag. I got this in the shade 2.0 N which was a perfect match (for reference I'm a C2 in Mac face & body). I thought this would be more dewy with less coverage but it dries semi-matte and gives plenty of coverage. My skin looks completely natural and normal in this foundation. I also thought the cap would break (because there is no lid) but it has a very sturdy lock. I can't believe it's so cheap. I'll definitely be repurchasing this. It's so cheap and it is so good..it makes my skin look flawless and it lasts all day even on my oily skin. Love this, it's lightweight, it looks and feels lovely. I'm 52 and have sensitive skin. I usually use mineral powder foundation but lately, that's been feeling heavy and has been a bit drying so I thought I'd try this. I don't want a lot of coverage, I want my skin to look like skin so this stuff is perfect for everyday use. It's lightweight, melts into the skin and evens out the skin tone beautifully. I don't use much, I smooth it on with my fingers and go over it with a buffing brush. It lasts all day and is so inexpensive. I love it. I usually wear Younique Touch liquid in Velour - ordered this in 1.1N as I didn’t want to pay £35 again. This stuff is amazing! As good as younique and as for the price - I will be buying this in future. I have combination skin with a few fine lines (40+) and lots of freckles and a few dark spots. Used with the Ordinary Silicone Primer and it has stayed fresh and dewy looking with great coverage all day after applying with a brush. Very happy. I’ve ordered the Ordinary coverage foundation too, looking forward to giving that a go. So being very fair I can NEVER find a foundation that matches my skin I bought 1.0 N Very Fair and it matches!!! I do not like using a full coverage foundation so this is ideal. I also have very dry very sensitive skin that is prone to breakouts, (and with a good moisturiser as a base) this is a brilliant foundation for my skin type. I only use 1 pump to cover my whole face and any areas I still want to cover I use concealer. It has ok staying power, wearing it for a work day it does settle a little bit and wears off a bit but a quick smudge and tap action with clean hands sets it back in place. It does not even oxidize badly, which is always something to watch out for. I would highly recommend especially for this price tag! Applies beautifully upon initial application, but as it dries (experienced this with shade 2.1Y) it oxidises darker and is orangey. Perfect lightweight serum to protect your skin from the sun and wind whilst uniforming complexion. I have recently discovered The Ordinary, and I love it - it works for my skin and the price is great. Was really excited to try this and the colour chart really helped! I have 2.0y medium. It's a very moisturizing lightweight foundation which is what I need - I don't need much coverage, and gives a very natural look and glow. I bought some for a friend and she loves it. I recommend. Very nice. The color 1.2P is good for my light skin. My skin look super with it. I really like this foundation. The colour range is fantastic, I'm always quite an in-between colour when it comes to foundations, but I managed to match myself perfectly. It sits lovely on the skin and is build-able. And what an amazing price?! The bottles are small, but a little of the products goes a long way so it will last a good while. Love this product!! For me is perfect!!! I can see a lot of bad reviews, but in my case works amazing. My skin looks flawless, my boyfriend all the time is impress because he said my skin looks beautiful and for me that is it. I will definitely be purchasing again. Is a light weight foundation with a good coverage in matte. This is basically water with colour. It covers very little and disappears in minutes. Crucially the colour I got, 2.1 Y which is a medium looking yellow undertoned beige online is actually bright orange, to the point that it reminds me of foundations from 20 years ago. I didn't even know brands made shades like these anymore. Literally no one has that skin tone. Straight in the bin it went. At least it wasn't an expensive mistake. People, the thing you have to understand about this foundation is this: it's just pigment. Nothing more and nothing less. And the brand is straightforward about it. This foundation doesn't have it's own properties, IT TAKES THE PROPERTIES OF WHATEVER IS UNDERNEATH. It's not skincare, it's not a BB cream. If you want a moisturizing foundation or oil control - you have to look elsewhere. This is just pigment suspended in water. If you have dry patches it won't help, if you're oily - it will slide off. So you prime your skin according to your needs and then you apply this pigment, end of story. The result is great! As for the pigment itself - it's good. Medium coverage. Natural finish. I got 2.0 YG (I am Sephora colour IQ 2y07), it does have a tiny amount of highlighter visible only in incandescent light and if you look closely and thoroughly. So bottom line is if you want no fuss pigment with medium coverage that just deposits a layer of colour on top of your skincare - by all means get it. I purchased the shade 2.1 Y and when it arrived I was beyond excited to try it. I mean a foundation that was lightweight but gave me decent coverage and for next to nothing?! Bargain. The shade was a tad too yellow toned but still matched well and you really are met with a seamless looking base once you're done. I was so shocked. I found no gathering in smile lines, no disappearing half way through the day, no cakey finish. I really thought I'd found the one, and then I started to break out. Clusters of whiteheads started to form on my cheek but I dismissed it thinking it was just hormones, y'know monthly spots etc. (... a few weeks early), but it was not. I should have researched and realised it's not the best for acne prone skin. So heartbroken over this short love affair. In short: heaven for those who don't have acne prone skin. For those that do, if you're willing risk it, if not keep looking for the holy grail. When purchasing I was unsure of which colour to go for so I bought the 1.0 N and 1.0 P. I can use either separately or together and they're a perfect match. After wearing all day they don't separate on my skin or look cakey and I love the coverage. I normally go for full coverage and with this being a light coverage I was nervous but it looks so nice and gives a nice finish. So pleased. I got the shade 1.1n and it matches my fair skin brilliantly. Although I didn't use the same brand primer that it recommended it went on smoothly and didn't settle into any pores, it smoothed them all out. When wearing all day it did tend to break up around the nose which most foundations tend to do anyway so that's why it's only 4 stars. I will be buying again though as it's a fantastic price. I absolutely love how this spreads and creates a natural finish that lasts all day. One pump can cover my whole face evenly using fingers only. Skin tone looks very even and natural, even my super light, pinkish Scandinavian skin. However I have had nasty cystic style breakouts since I started using it and when I stopped the breakouts have reduced. So beware if you have sensitive skin prone to breaking out. Sheer lightweight coverage that feels like skincare instead of makeup. Very moisturising and gave a smooth finish and doesn't end up looking cakey. I am not one to wear heavy foundation, but was looking for something a little bit fuller coverage for days I want to wear more than my cc cream. this foundation is perfect, and the price definitely helps. Definitely buildable, and for someone who is suuuper pale the lightest shades are a nice addition. The perfect foundation for a ridiculous price. I thought bare minerals was the best but now I found this one. Beautiful colour, sheer coverage, looks very natural and healthy with a pretty glow and stays the whole day in place.